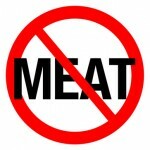 I always considered my mom odd because she’s not a vegetarian, yet she doesn’t eat meat. Doesn’t like the taste of it. Would rather have her staple: bread and cheese. I’d look at her strangely, spreading cream cheese onto a cracker, as I chowed down on meaty, caloric Filipino food. I felt like she was missing out. I’ve now become my mom because I’ve sorta stopped eating meat. Don’t get me wrong. I love me my crispy bacon every single weekend morning. In-n-Out cheeseburgers make me incredibly happy. But I no longer order red meat at restaurants. I avoid the steak and go straight for the sea bass. If I’m at an Asian restaurant, I’ll choose the tofu or prawns instead of chicken, beef, or pork. It makes me sick to my stomach when I’m eating an entree like fried rice and get a chewy piece of chicken. The kind you can’t bite through. You have to consume the tidbit whole. I spit it out and almost want to vomit. Totally disgusting. I’m completely done with the meat options. Pass the seabass.